Secretz Regretz is a selection of music illustrating the life of Margaret of Austria, Regent of the Netherlands and one of the most powerful – and misfortuned – ladies of the Renaissance. 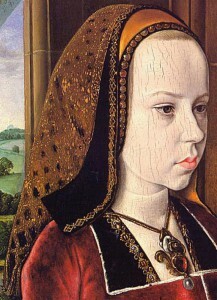 Orphan at age 2, repudiated by future king of France at age 11, twice widow (first of the Spanish prince Juan de Castilla and then of Philibert, Duke of Savoy) and prematurely deprived of her beloved brother Philip (the Fair), Margaret found consolation in the music of her court singers. Music by Johannes Ockeghem, Loyset Compère, Pierre de la Rue, Juan del Enzina, Antoine Brummel and Josquin Desprez. 4 voices (soprano, alto, tenor, bass), Renaissance transverse flute, viol, lute, clavicymbalum.